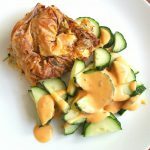 This recipe for Italian stuffed chicken breasts is one of my go-to summer recipes which I cook all the time because it’s very quick to make, it’s really rewarding in flavour and it’s a nice, light main meal for those days when the sun is melting the tar on the roads. During the summer I lose all inclination to eat heavy food and instead of having my main meals with potatoes or ‘heavy’ root vegetables I much prefer my meals to be accompanied by salads. These Italian stuffed chicken breasts are an excellent meal to serve with a light salad because they’re substantial enough to satisfy even the heartiest eater. 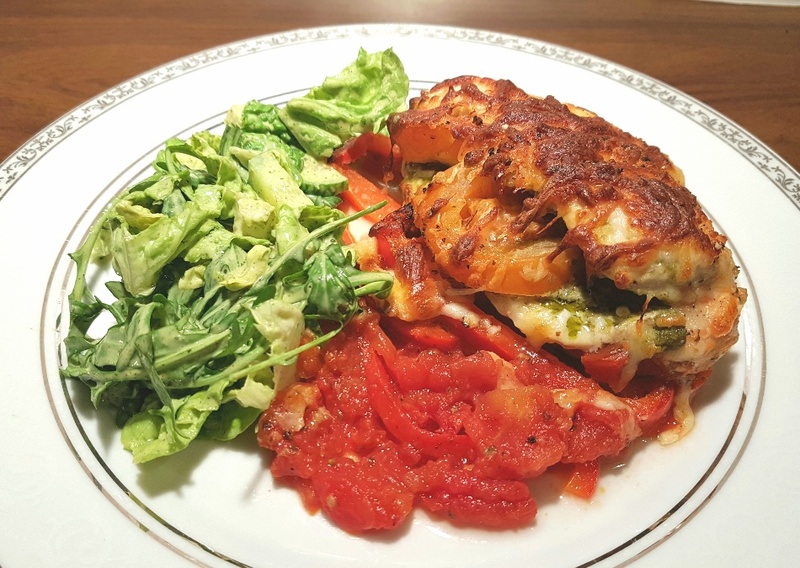 The ingredients list for this recipe isn’t particularly long, but they all come together to produce a well-flavoured meal which positively sings with traditional Italian flavours. The fresh basil leaves and the dried oregano meld beautifully into the soft, melting mozzarella to provide a succulent filling for the butterflied chicken breasts. They are cooked on top of a bed of chopped tomatoes and sliced red pepper which creates a really simple and hassle-free sauce to go with them. 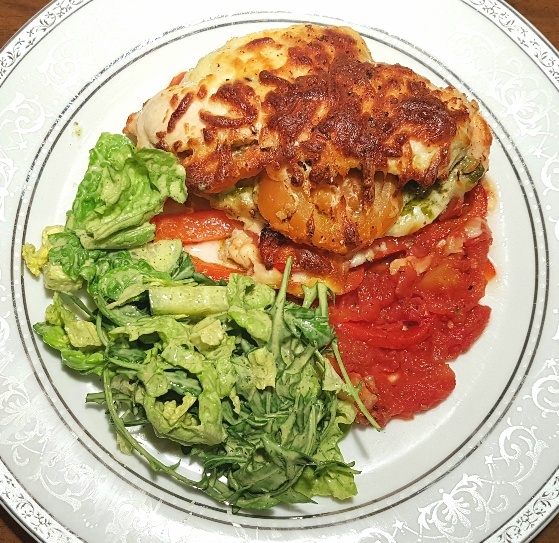 These Italian stuffed chicken breasts are a brilliant quick dinner for when you need something to cook mid-week that’s really rewarding in the flavour department. The chicken is soft and tender, its stuffing is creamy and filled with herby flavours, and the sauce is rich and fresh. All it needs is a fresh green salad that’s tossed in my homemade ranch dressing to go along with it. Preheat your oven to 200C/180C Fan/400F/Gas Mark 6 and have a casserole dish to hand. Pour the chopped tomatoes into the casserole dish and add the slices of red pepper. Put the chicken in the casserole dish and repeat with the other chicken breasts. Once all of your chicken breasts are stuffed and in the dish, scatter a bit more grated mozzarella on top of the chicken and then cook them for 30-40 mins until the chicken is cooked all the way through. Serve with the sauce on the side and fresh salad leaves. If you like this you can buy the E-book! Or you can buy the paperback edition! If you like this try this! Stuffed chicken breasts is looking amazing. Bookmarking this recipe. Hi Jane and congratulations on your book, I just bought it! We met last year at Susan Gardners course, im very happy you’re living the dream. My partner needs to stick to the low FodMap diet but can’t and won’t cook so ive started making him fodmap friendly meals that he freezes. Do you think the above could survive being cooked and frozen and reheated?